It has been a wonderful year so far; after seeing one hundred shows since July I’m still energized and enthusiastic about theatre in Cincinnati. And we have some of the best young talent right here in the nation at the University of Cincinnati College-Conservatory of Music. 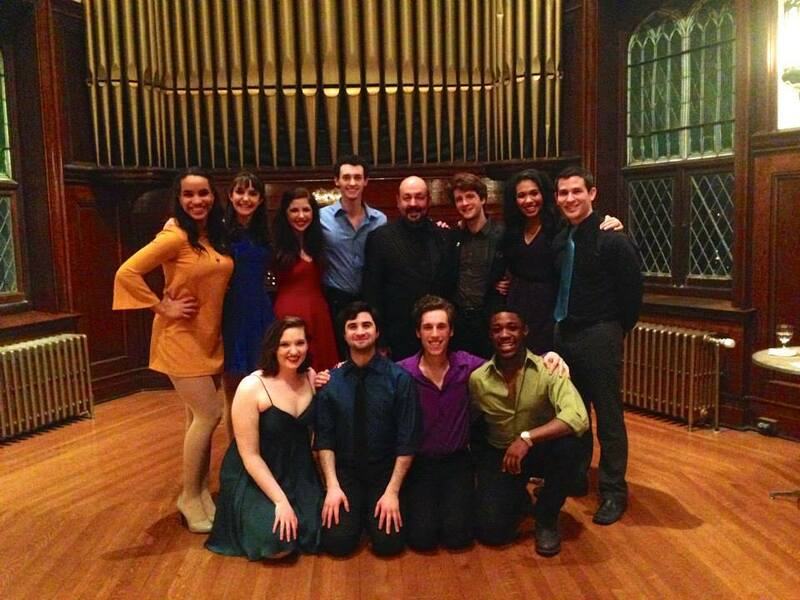 Last night I had the privilege of seeing PERFECT HARMONY, a cabaret in the Cohen Studio Theatre on the UC Campus. PERFECT HARMONY featured songs in the spirit of The CCM Harmony Fund. The CCM Harmony Fund was established to celebrate the language of the arts, encourage conversation and advocate compassion. The fund supports the students and faculty at the College-Conservatory of Music in creative ways to promote culturally diverse audiences and fight hate and prejudice. This cast full of mostly Juniors (and one sophomore) blew the socks off of those in attendance, including me. Accompanied the brilliant Danny White on piano (he is really terrific! ), these students were fabulous. From the rousing opening number, “Heart & Music,” it was obvious we were in for a treat. As director Aubrey Berg told us, this collection of songs – in line with the philosophy behind the Harmony Fund – was to celebrate how far we’ve come as a culture around the issues of hate and diversity. Tom Meglio, a brilliant writer and performer, wrote the text after he interviewed his fellow cast members to bring a cohesive story to the cabaret. Featuring blow-your-socks-off performances from Hannah Kornfeld, Raven Thomas, Cameron Hill, Kameron Richardson, Chris Collins-Pisano, Madeline Lynch, Nate Riccio, and Casey Wenger-Schulman as well as some tender moments from Adam Zeph, Nick Pellacio, and Tom Meglio, this impressive ensemble delivered. And then some. Highlights were “Miss Cellie’s Blues” from THE COLOR PURPLE by Raven Thomas and Cameron Hill, which highlighted Thomas’s sultry alto chops and Hill’s upper register. Also, superb was “Feelin’ Good,” by Kameron Richardson and his incredibly sincere and emotional rendition of “Grateful.” He meant what he was singing, as evidenced by very real tears. I also very much enjoyed Kornfeld’s hilarious “An Old Fashioned Love Story” from THE WILD PARTY as well as her fantastic version of “Somewhere Over the Rainbow.” Chris Collins-Pisano sang about being “The Last One Picked,” with hilarity. There’s a line about being good at Scrabble; I can tell you that I’ve gone head to head with Chris in Words With Friends and he’s quite the wordsmith. That tickled me. Nate Riccio made a cameo late in the show, in drag, and wowed the audience with his rendition of “I Am What I Am” from LA CAGE AUX FOLLES. This performance tore down the house, and was a nice climax before the stunning – and hopeful – resolution of “Somewhere” from West Side Story. Tom Meglio performed a bittersweet, quirky version of “If You Could See Him Through My Eyes” from Cabaret with a ventriloquist’s dummy. Meglio has a knack for being funny, sweet, thoughtful, and deep all at the same time. His written text throughout the show was simply brilliant, natural, and unique to each performer. I can’t wait to see what his senior year brings. PERFECT HARMONY was a moving, wonderful piece of musical theatre art and I consider myself quite fortunate that it was my 100th show this season. I’ll be back to CCM on Friday and Saturday for the Senior Showcases in Drama and Musical Theatre – and I expect to be wowed, moved, and impressed yet again.